Maintenance and improvements construction is complete in Old Town and Civic Center parking structures. Permit parking: Must update your permit information with Parking Services. Once your information is updated, your license plate will serve as your permit and you may come and go as you please. Hourly parking: You must pre-pay for the time you expect to be parked in the structure. You may pay via the stationary pay station or via the FC Parking App. You must enter your license plate number which will serve as verification of your payment. Please see details in the brochure here. The purpose of retrofitting the parking structures with new technology is to address several issues – the gates and pay stations in the garages regularly malfunction leaving patrons trapped and in need of rescue, during busy times (each day after work) the auto queue backs up at the gates creating frustration, and currently it’s unpredictable if and where spaces are available. All Parking Services structures will be made gateless, as our newest Firehouse Alley Parking Structure. This is the newest technology available with digital signs that provide number of available spaces and level, as well as indicator lights to help you navigate through the structure. The removal of the gates and the introduction of pay stations and app-based payment is part of a larger strategy to improve parking in Downtown. The FC Parking App will not only allow you to pay for your parking and extend your session, it will allow you to navigate to available parking spaces in the parking structures and on-street in one consistent system. Permit holders in the garages will not have to do anything upon entering and exiting – your license plate is your permit. If a patron wishes to pay at a pay-station instead of using the app, they can choose to receive a text message when their time is almost expired with the option to extend (only if paying by credit card). This makes it easy to begin with less time and add time as your visit extends. The sensor technology transmit to the digital sign at the entrance to display how many spaces are available on each level of the parking structure. Lights above each stall will tell you which spaces are available at a glance. These additions to the Downtown parking are being made to make the system more cohesive, easier, and more predictable for all users. Please feel free to call Parking Services with any further questions or concerns. Our department purchases multiple permits for our fleet vehicles, do I need to do a new form for each vehicle? To keep this as simple as possible, complete one form per department and send copies of registration or pictures of the license plates for each vehicle. A permit does not guarantee a space, however there are only a few times during the year that our structures or lots are at full capacity and it generally only lasts a short time. While we do not guarantee a space and cannot allow them to park on the street in the two-hours spaces and prevent them from being cited, we do want to do our best to provide exceptional service and find alternatives when we can. Will the first hour still be free? Yes, but you will need to pre-pay to receive an hour free. This must be done before you walk out of the structure or the enforcement officers will not know you are parked legally and issue a citation. Why is there construction occurring in the parking garages Downtown? 1) Regular sealant maintenance that keeps water out will ensure a longer life for our garages. 2)Update of the Old Town Parking Structure (corner of Mountain and Remington) and Civic Center Parking Structure (corner of Mason and Laporte) with the same technology as the Firehouse Alley Parking Structure (next to the Elizabeth Hotel). The technology is a pre-pay by app or pay-station system with navigation tools indicating available parking. Why is the project happening? What's the purpose? The removal of the gates and the introduction of pay stations and app-based payment is part of a larger strategy to improve parking Downtown. These additions to the Downtown parking are being made to make the system more cohesive, easier and more predictable for all users. The existing gates and pay stations in the garages regularly malfunction, leaving patrons trapped. During busy times (each day after work), the vehicle queue backs up at the gates, creating frustration. It’s unpredictable if and where spaces are available. What are the benefits of these parking changes? 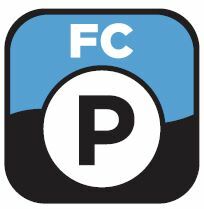 The FC Parking App will allow you to pay for your parking and extend your session. The new setup will also allow you to navigate to available parking in the parking structures and on the street in one consistent system. Permit holders in the garages will not have to do anything upon entering and exiting. If a patron wishes to pay at a pay-station instead of using the app, they can choose to receive a text message when their time is almost expired with the option to extend. This makes it easy to begin with less time and add time as your visit extends. The sensor technology will indicate on a digital sign at the entrance how many spaces are available on each level of the parking structure. Lights above each stall will tell you which spaces are available at a glance. What other parking projects are coming to Downtown? SENSORS - In the coming year, the City will be installing sensors in Downtown’s on-street parking spaces. This technology will allow Parking Services to understand occupancy and turnover rates to improve management of spaces. Also, the sensors will link to the FC Parking App and show where available parking spaces are located. ENFORCEMENT – Based on the data we receive from the sensors, we anticipate eventually extending the 2-hour parking time-limit to 8 p.m. on weekdays and on weekends. This will encourage turnover of these high-demand spaces during a very busy time in the evening. PAY-TO-STAY – After 2 hours, instead of leaving or moving your vehicle, you will be able to pay to extend your stay on-street via the FC Parking App. How do I get the FC Parking app? Sign-up for the Parking Services email newsletter for updates!